There seems to be no end to the amount of spooktastic family fun to be had this year in the name of Halloween! If you feel your teeth chattering already then La Nuit des Chocottes in Divonne-les-Bains (France) is definitely the event for you. 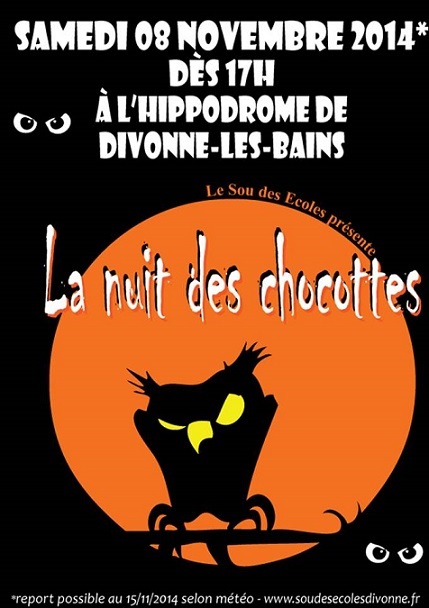 From 5pm on Saturday the 8th of November 2014 little ones aged 3 to 12 accompanied by their parents will be meeting at Divonne’s Hippodrome indoor car park to begin an evening of spine-tingling, frightful fun. The evening will begin at 5pm when children and their parents will gather at the car park dressed in their scariest Halloween outfits and will be split in 3 age groups (3 to 5, 6 to 8 and 9 to 12). Each age group will be accompanied by a story-teller who will set the scene for this scary evening. All children and parents, armed only with plenty of courage and their pocket torch lights – will go through a series of activities such as creative make-and-do, riddles, sensory games, sports activities and much more. At the end of this candle-light trail, all participating kids will taste Hululu la Chouette’s magic potion and watch the dance show “Les morts vivants” performed by Sophie Wikberg’s dance company. In case of really bad weather on the 8th of November the event will be postponed until the 15th of November 2014. The scary trail takes approximately 1 hour to complete and starts at 5pm but you can reserve a different time slot by booking your places in advance at Divonne’s tourist office. Story time and activities will take place indoors, while the trail will be outdoors, so remember to bring boots for the children. All activities and story-times will be in French. Tickets for this event are 5€ per child and can be reserved in advance from the Divonne Tourist Office. The event is organized by the Sou des écoles de Divonne les Bains and all proceeds will go to the association that supports Divonne’s local schools. From 5pm at the Hippodrome in Divonne-les-Bains (France). Take the motorway A1 to the Coppet exit, cross the border to Divonne-les-Bains and then turn right at the first roundabout. You’ll see Divonne’s lake on your left and the hippodrome on your right, there will be signs directing you to the event.